More than 1,200 websites that claim to sell cut-price designer goods have been shut down in the biggest police operation of its kind in the UK. The 1,219 sites, which advertise brands including Ugg boots, Tiffany jewellery and Links of London, were removed by the Metropolitan Police. Customers who buy from the sites either receive nothing, counterfeit goods, or have their credit card details stolen. Criminal gangs in Asia are believed to make millions of pounds from the fraud. 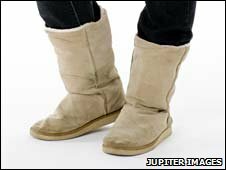 In the past 12 months, complaints about fake Ugg boots have tripled and customs officers have seized more than 20,000 pairs. More than 400 of the removed sites were thought to be advertising the boots. Central e-crime unit head Det Supt Charlie McMurdie said: "This is the biggest operation of its kind in the UK. "Where people are placing their credit card details onto an internet site and that site is being controlled outside of the UK by criminal networks, then there's the obvious potential those details will be used for other fraudulent activity." The criminal gangs try to make the sites look as legitimate as possible by registering a domain name with ".co.uk" at the end. They use false details or hide behind anonymous e-mail addresses when signing up, and are almost impossible to trace. Nick Wenban-Smith, senior counsel for Nominet, which manages more than seven million UK domain names, said the sites had effectively been frozen, and could not be re-registered or recycled. "It's a fantastic result for UK consumers, Nominet's mission is to make the internet a safe and more trusted place, and the UK jurisdiction has an excellent reputation. "This is just one more example of our efforts to preserve that position," he said. Consumer Direct, Trading Standards, the Office of Fair Trading and manufacturers also helped identify the fraudulent web sites. People who might have bought products from one of the sites are advised to contact Consumer Direct. Consumer minister Kevin Brennan said scam websites cost the economy thousands of pounds each year. "These sorts of websites prey on consumers and, as you can see from the work of the Metropolitan Police, all agencies involved are working hard to make sure this sort of con is stamped out," he said. "We already have 'scambusters' teams throughout the country and, as we announced earlier this year, we are planning to set up new internet enforcement teams to target online scams in order to protect consumers."